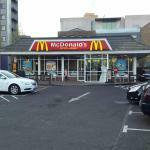 I like this McDonald’s and order from them regularly when I am suffering from a deadly hangover (most weekends.) I like to order a fillet o fish when I’m feeling wild. The tartare sauce really hits the spot when you’re hungover. My lovely fillet o fish burger arrived with a perfect bun and the cheese actually inside the burger this time. After taking my first bite I was dissapointed to discover that the tartare sauce had been substituted with MAYO. Please don’t do this. Thanks. This restaurant is open 21 hours a day. I've used the restaurant several times. The food is good value. One orders from the touch screens then shuffles forward until your number is called. Uber drivers appear to have priority and push in front of everyone else to collect their orders. Musac plays continuously. The service can be slow and chaotic at busy times, and some orders, especially drinks, appear to be forgotten about. These factors encourage me to eat somewhere healthier for my body and self-esteem. Went to visit this restaurant at 9pm but it was completely cordoned off by security. Not the police, just an angry security guard who gave no explanation whatsoever and was very rude. I assume it was a public health emergency or sewage spill but couldn’t get any answers. 20 minute wait after ordering, restaurant was dirty. Printer didn't print order. Steady stream of deliver riders collecting preordered meals bumping walk in customers. I counted 11 while waiting. When my meal came, it was a medium and I ordered a large - no napkins and no straws! Awful. 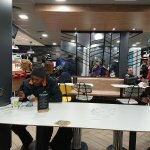 Been to Mcdonald's Restaurant? Share your experiences!